As many of the QUALTROUGH family originate from the Rushen Parish in the Isle of Man, it is hoped that this compilation will assist those who do not live on the Island to understand why their ancestors maintained such a love for their origins, yet at the same time see how the confines of the area necessitated their decision to emigrate to new lands. 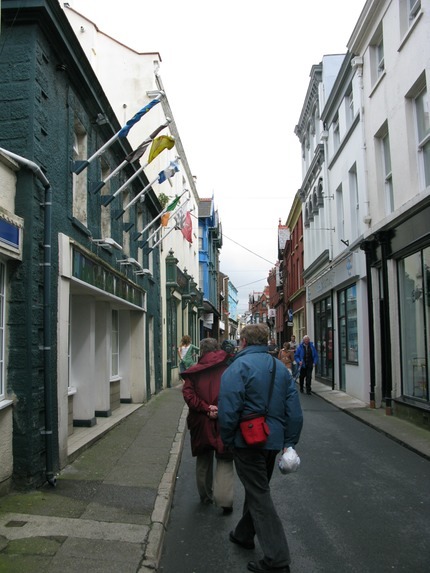 Rushen parish lies in the south-west extremity of the Island and is about five and a half miles in length from north to south and an average of one and a half miles from east to west. The Church, which is the center of the parish, is a plain unadorned building, rebuilt in 1775. The central part of the district is fertile productive land, however the north and south portions are bleak barren highlands. There is plenty of limestone of the best quality and old mines such as Glenhass, between Port St Mary and Spanish Head produce high quality lead ore. 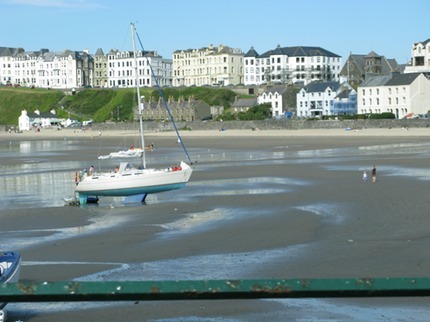 PORT ERIN lies on a bay of the same name is a small village and sea-port. It comprises of 40 dwellings, a small Wesleyan chapel and a comfortable inn. The employment of the inhabitants is fishing and husbandry. The bay, which forms a natural square, has good anchorage. Breda (Bradda) Head, a bold and abrupt precipice, forms the north boundary of the bay. Many fishermen leave from Port Erin to fish off the Calf of Man, some 3 miles south-west. 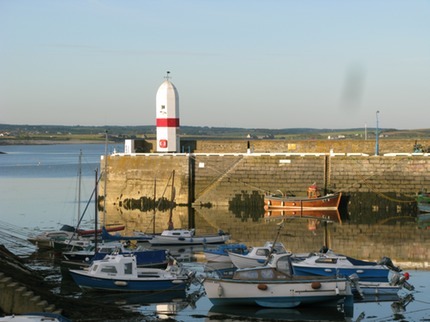 PORT ST. MARY (or Port-le-Mary) is a busy prosperous village and sea-port situated on the western side of a large bay on the south shore of the Island. 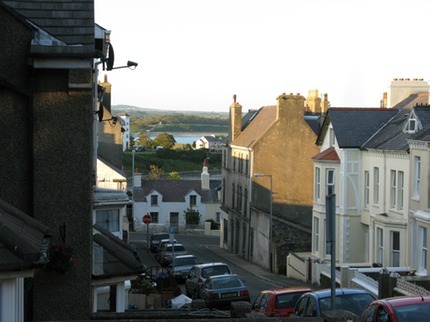 Most of the 80 dwellings are principally built close to the harbour which is protected from the violence of the sea by a large stone pier. Another breakwater is about to be built (in 1837) to complete the security of the port. Most of the fifty light vessels from 15 to 40 tons belong to the village and are employed in the fishery during the season. A view of the Calf of Man and Calf Sound from the main land of the Isle of Man. 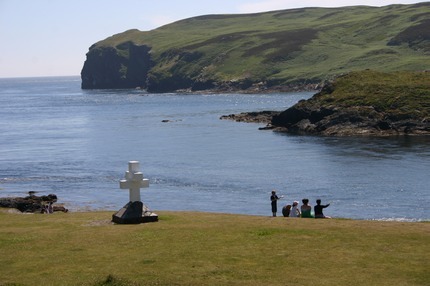 The CALF OF MAN is separated from the Island by a dangerour channel of five hundred yards width. Its area is 569 acres and is partly cultivated (in 1837). Much of the island is elevated and a great part of the coast is composed of high rocky cliffs. While the descriptions are over a century old it seems appropriate to leave them written in that time period to enable the reader to appreciate the circumstances of the environment and life-style of the time. It was on this that many decisions were made to emigrate to the New World of America and Canada and the far-off colonies of Australia and New Zealand or perhaps in many cases to just cross to England. Whatever the reason and wherever our ancestors chose to go, it was always the Isle of Man that was home to the first generation. Subsequent generations of course identified more closely with the new homelands. And finally there were those who chose to stay on the Island and descendants of these are still in Port St. Mary and surrounds today. All were hardened individuals whether they emigrated or stayed. They had to be for to survive anywhere in the 1800’s was a feat of endurance and strength. It is these characteristics which hold true in many or most of their descendants.